Pollard Freeman (1796-1858) was the son of Watertowns Richard Freeman. His brother was Dolphin Freeman. Pollard was baptized in Waterburys Episcopal church shortly after his birth. His father died when Pollard was 19; Samuel Nettleton became his legal guardian, while Samuel Hickcox, cousin to Nettleton, became Dolphins guardian. Pollard inherited a number of items from his father, including a blue coat, a linen shirt, and a sugar bowl, as well as a portion of the family farm, located on Echo Lake Road in Watertown. Pollard married Esther Stephevens on April 17, 1825. Esther was from New York, where she was born in 1797. The 1830 census shows Pollard as the head of his household, with two young boys and two women, presumably his wife and his mother. Esther became a member of Watertown's Congregational Church in 1836. In 1850, Pollard was a laborer, and his real estate was valued at $1000. He died on December 4, 1858. Pollard and Esther had three children: Henry, born in 1826; George, born in 1829; and Emeline, born in 1833. George died in 1857, when he was 28. Henry married Augusta Jackson on October 9, 1850 in nearby Woodbury. Augusta, born in 1828, was originally from New York. By 1860, her family had moved to Watertown. Her mother, Julia, lived with her, while her brother William and his family lived next door. Henry's mother and sister, Esther and Emeline, were also neighbors. The extended family lived in separate houses on the Freeman farm. Emeline later married George Jackson, Augusta's brother, and had two children: George, born in 1869, and Alice, born in 1872. Emeline and her husband may have died in the 1870s: in 1880 their children were living with Emeline's mother, Esther. Henry and Augusta had nine children. The first two, twins, died in infancy in 1851. Their other children were George, born 1852; Julia, born 1854; Pollard, born 1856; Robert, born 1858; Augusta, born 1860; Frederick, born 1861; and Lot, born in 1863. In 1880, Henry was working as a laborer while Augusta kept house. Their son Robert, also a laborer, still lived at home. Pollard was a servant in the household of Merritt Heminway. Frederick and Augusta both worked for Alfred Scovill. Frederick was a laborer on Scovill's farm, and Augusta was a servant. By 1900, Henry was dead, and Augusta lived on Woodruff Avenue, near Hillcrest Avenue, with her sons Frederick, who worked as a coachman, and Pollard, who was a laborer. Also living with Augusta were her daughter, Augusta, and grandchildren Pollard Jr, Robert and Augusta. Lot worked as a janitor for the Taft School, a prep school for boys, and lived on Highland Avenue, near Middlebury Road. Lot Freeman married a woman from Georgia named Fannie (1884-1967). In the 1920s, Lot worked as a chauffeur and Fannie was a servant at Taft. They had a son named Augustus (1905-1995), who worked as a resident orderly at Taft and later was employed by The Stevens Company. By the 1960s, Augustus and his mother had both moved to Waterbury. Detail of Clark's Map of Litchfield County. 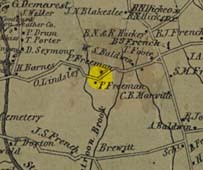 Pollard Freeman's farm is highlighted. It was located on Echo Lake Road in between what are now Ice House Road and Adams Road.